Medieval English Hammered Farthings: Edward III - Intro. An interesting reign to collect - as there are a number of quite distinct types. While the weight of the coins remained unchanged from those of Edward II, the purity/fineness was reduced. An indenture of 1 March 1363 appointed Henry de Brisele as Master of the Mint in the English possession of Calais. The indenture authorised denominations to be struck that matched those in use in England, with the provision that 'a hundred pounds' weight of silver per annum was to be coined into ferlings, or farthings. '¹ For the king's part, he agreed that once a month a procalmation would be made in Calais forbidding the use in the locality, for any purpose, of any money except that issued by the Calais mint. Those who did not comply could have all their non-Calais money confiscated and be imprisoned. It is a mystery why no Edward III Calais farthings are known - the authorisation to specifically produce them was issued in 1363. If London dies were used to produce farthings in Calais, then it would not be possible to identify them as produced in Calais and those using them would be subject to the harsh penalties specified in the procalamation. The first known farthings from the Calais mint were struck under Hevry V, 130 years later. during the reign of Edward III? 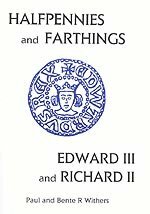 What did a farthing buy during the reign of Edward III? ¹ WALKER. AS. 1921: 'The Calais Mint, AD 1347-1470' BNJ 16, p. 77-112.